Unfortunately, Delta does not allow AwardWallet to access information on your behalf from Delta.com. As a result, we cannot offer the option of obtaining your SkyMiles balance from Delta.com. 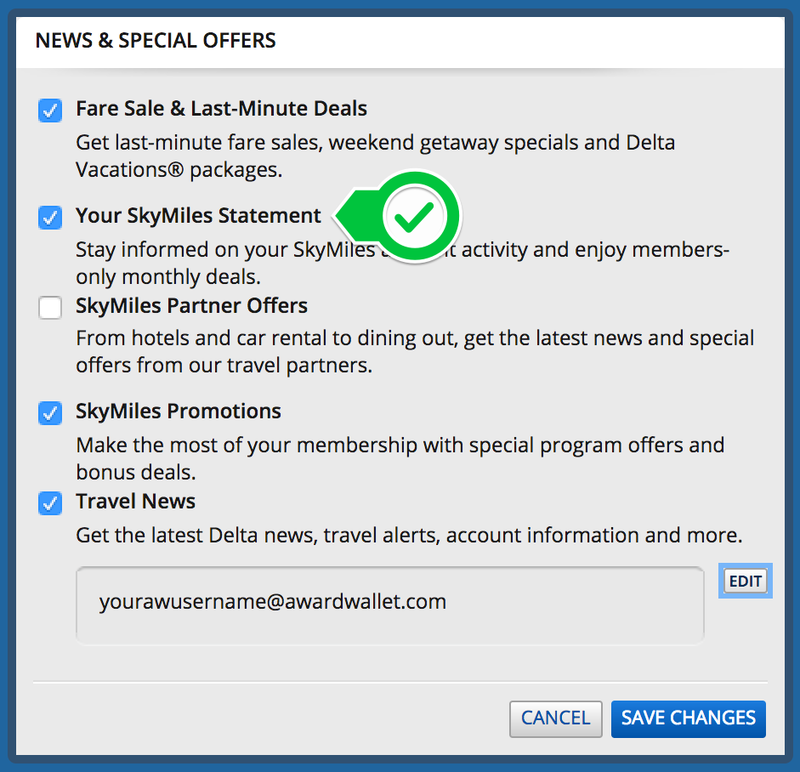 You can configure your email provider to forward SkyMiles monthly statements and reservations to your AwardWallet mailbox, or you can update your Delta profile with your AwardWallet email address. Make sure you add your Delta account to your AwardWallet profile with the correct SkyMiles account number (this is how we will know what account to update). Finally, you will need to opt-in to receive your SkyMiles statements. 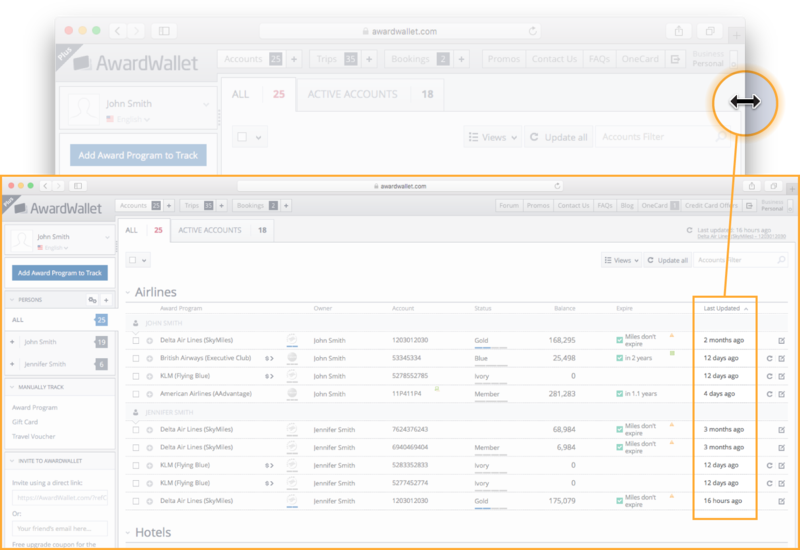 AwardWallet supports more than 670 other loyalty programs, and we are trying to establish a business relationship with Delta. If you wish to voice your opinion, you can do so by tweeting to the official Delta Twitter page or signing our Change.org campaign to allow AwardWalet to support Delta SkyMiles. Reach out in the comments if you have any questions and thank you for your continued support of AwardWallet! Did you know that with a wide display you are able to expand the AwardWallet window to see the Last Updated column? You can easily see the last time your balance was checked by AwardWallet. Does this work around work with SW & United as well? 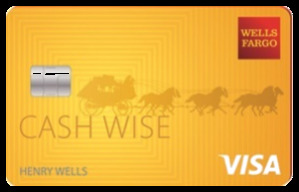 Why would you offer the Delta (and others) Credit Card offers on your website if they do not participate in your Program? Why support them if they do NOT support you?? 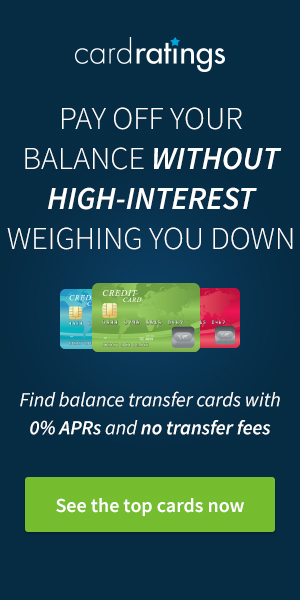 While Delta as a company has chosen to request we not access their site on behalf of our members, we can’t ignore the fact that American Express and Chase have card products that make sense for anyone loyal to those respective airlines. Well, I can’t see the points of this: if you get the email with monthly statement in your email box why bother to route it via awardwallet then? Doing this provides you a mechanism to keep all your points/miles tracked in one location. If Delta is your only rewards account, I would agree with you, but assuming you have other rewards accounts, this allows you to keep everything in one place. How does this work with multiple persons attached to one account? I’ve got my wife and children added on my account. If I have their Delta statements forwarded to my awardwallet email address (meaning multiple Delta statements coming to the same AwardWallet account), will AwardWallet be able to apply each to the appropriate person? Hey Bill, great question. If you added multiple Delta accounts to AwardWallet, there will be a unique email address generated for each one. Just click the edit button for each in the account list, and you’ll see that the email for your family members’ Delta accounts look something like this: YOUR-USERNAME.SPOUSE-NAME@awardwallet.com. Just copy the correct email to each of their Delta accounts, and we’ll update the balances based on the Skymiles statement. Any chance that Delta (or United or Southwest, for that matter) will ever change their mind on this? It doesn’t make much sense to make things more difficult for their customers.